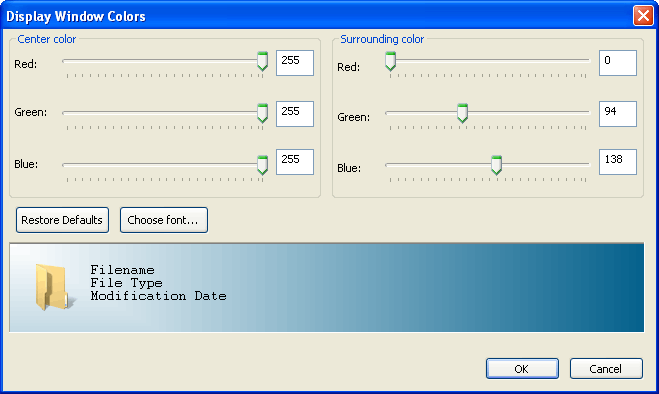 This dialog allow you to customize the colors and font of the Display Window. See below for a brief description of the color gradient used as a background. The Display Window background is a diagonal color gradient in 2 directions. Think of the Center color as the starting point of the gradient - a single point in the top-left corner of the Display Window ; the Surrounding color is the final color, located in the bottom-right corner. The gradient is drawn diagonally from top-left to bottom-right, but also in a pseudo-complementary (ie. at 90°) direction. The end result is a pleasing diagonal gradient with colors on the left generally close to the Center color and colors to the right generally close to the Surrounding color. The algorithm behind drawing the gradient is not useful; the colors should just be adjusted visually for the best combination. The controls for the Center color (ie. top-left corner) allow RGB (Red/Green/Blue) adjustment, either by moving the slider or by entering an integer (0..255) in the edit box to the right of each slider. For a little help with RGB colors, see this site. The controls for the Surrounding color (ie. bottom-right corner) allow RGB (Red/Green/Blue) adjustment, in a manner similar to the Center color. but nearly any font may be used. This button opens a standard Windows dialog allowing the user to choose a suitable font for text in the Display Window. Headings and information text both use this font. See comments in Restore Defaults regarding the font used. This area previews the color gradient and text using the selected font. Changes made to the Center color and Surrounding color are previewed, as the changes occur, so that the user may choose the color gradient visually.